An eclectic community of local farmers, small shop owners, chefs, bakers, and artisans have turned a once sleepy little town in northern Virginia’s Fauquier County into an unlikely destination for formal and casual dining, antiquing, shopping, and just hanging-out. Interstate 66 to Exit 23 welcomes you to the now-happening Marshall and a sign announcing the town’s lineage tracing back to 1797. Then, as now, the surrounding countryside attests to the importance of agricultural in the town’s growth and development and dovetails nicely with the farm-to-table philosophy practiced by Marshall’s new crop of restaurants and eateries. Marshall’s new mojo, from sleepy to vibrant, starts with Main Street. Officially Route 55, it has served for more than two centuries as the hub of the community. Dining options of all kinds mix with antique stores, an upscale design store, potter’s studio, and old-fashioned butcher. Dining options cover a wide spectrum. Breakfast all day at the Marshall Diner, a local favorite that has been around for many years, is served along with a vast menu of sandwiches, burgers, side dishes. The breakfasts, lunches and dinners are good diner food at good diner prices. 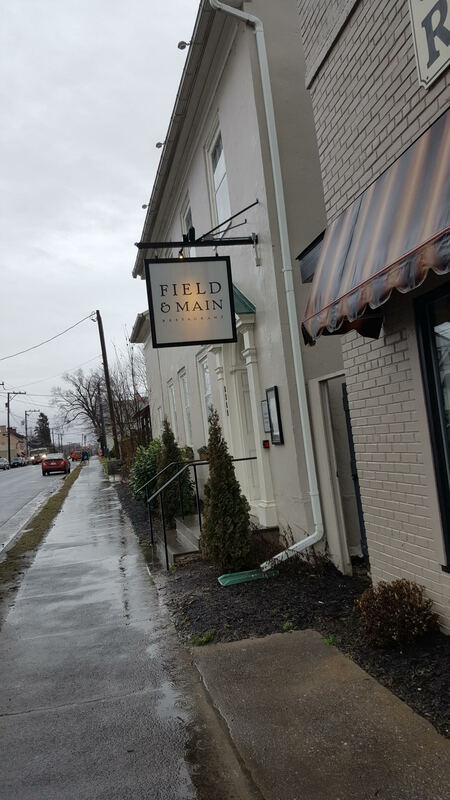 Fine-dining restaurant Field and Main pays homage to Marshall’s history by recognizing that dairy, cattle and commodity farmers would bring products from nearby fields to Main Street. Two hundred years later, little has changed. Owners Neal and Star Wavra still depend on the locals for fresh meats and produce. This charming upscale eatery serving Southern-inspired fare & fine wine is receiving rave reviews and national recognition. 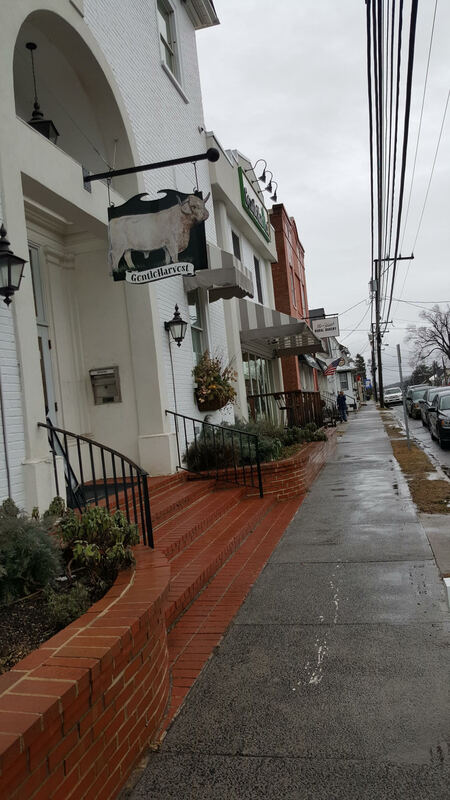 Gentle Harvest, across the street from Field and Main, carries organic meats, poultry and produce from Ayershire Farm in Upperville, Virginia, a certified organic farm. But it’s so much more. Think a compact version of D.C.’s Eastern Market offering an interesting menu to eat-in, take-out, or even pick-up at take-out window. Craft beers, a coffee bar, excellent wine selection, local honey, chutneys, flower bouquets are just a sampling of the many available items. Next to Gentle Harvest is Red Truck Bakery. Proprietor and baker-in-chief Bryan Noyes has a very successful retail site in Warrenton, Virginia, but was prescient enough to see a future in Marshall for a second shop. His cupcakes, cakes, and pies are shipped all over the world. 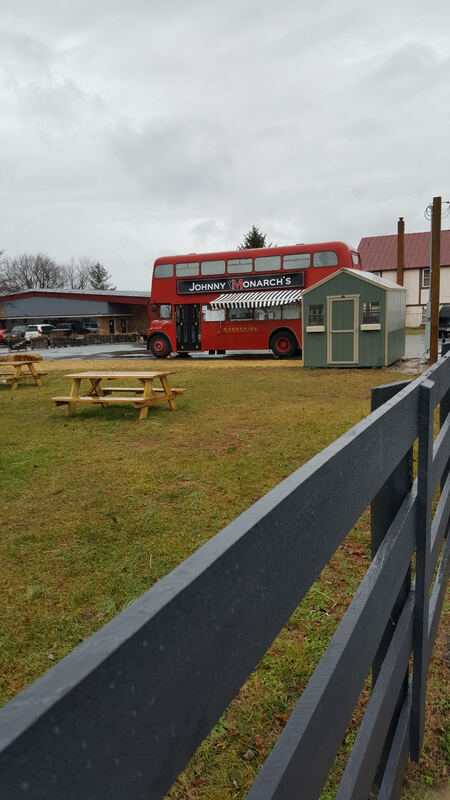 Red Truck is a popular local hang-out and meeting place for breakfast and lunch and offers delicious home-made soups and sandwiches for vegetarians and carnivores alike. The Whole Ox is based on whole animal butchery, using all parts from nose to tail. The meats are raised ethically on pasture without the addition of hormones and antibiotics. Items on the eat-in and take-out menus change daily depending on what is available locally. Wines, breads, and many other items are available. Yes, that is a British double-decker bus on Main Street. Welcome to Johnny Monarch’s. While it looks a bit whimsical, the food is deadly serious. According to Facebook, the menu offers two distinct types: Gourmet Truck Driver fare and Fuel for Olympians. Many recipes are sourced from the U.S. Olympic Training table menus and provide the highest level of nutrition currently available locally. Customers line-up for Johnny Monarch’s award-winning signature dish, tomato pie. A Marshall Main Street original, family-owned and operated Joe’s Pizza has been serving good, down-home Italian fare to the residents for years. Pizza, pastas, subs are all served in a comfortable and authentic rustic setting–even down to the red-checkered tablecloths. But a warning: all the pizzas are freshly-made when ordered so buying just a slice or two can’t be done. Order a personal size pizza consisting of four slices . . . so much better than the single slice that has been under the heat lamp for who knows how long. Like antiquing? Visit Robin’s Nest, The Three Hens, and the Middleburg Humane Society Resale Store. All carry an ever-changing mix of furniture, paintings, quilts, jewelry and estate items. While you may be tempted to spend all your time exploring historic Marshall, the unique and funky do not stop here. Main Street, Route 55, in the words of the BeeGees, is staying alive. The next mile going East is a mish-mash of artisans, retail, and history. 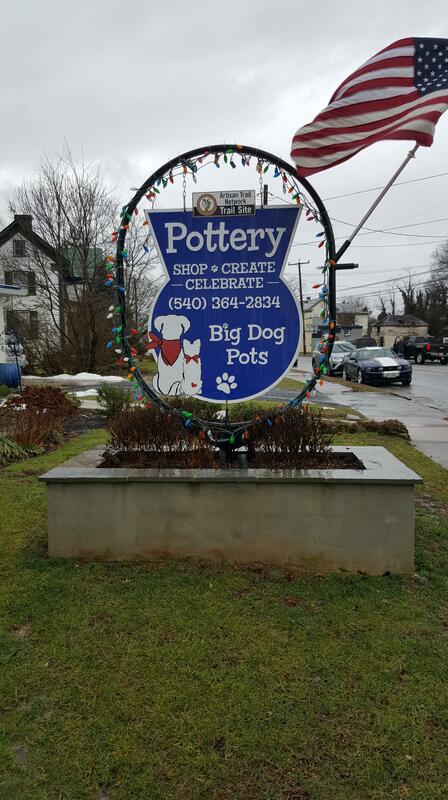 Don’t miss Big Dog Pots Pottery, a working studio offering pottery classes, parties, events and unique gifts. Across from Big Dog Pots Pottery, Nick’s Deli is reputed to have the best fried chicken in the region. Your final destination on this Route 55 Alive tour is Tri-County Feeds, Fashions, Finds. If your shopping list includes chicken feed, Dubarry boots, an unusual gift for your sweetie, hay for horses, and a Patagonia jacket, you have just succeeded in one-stop shopping. Tri-County’s genesis was a provider of all things horsy to the local equestrian community of horse trainers, breeders, competitive riders, and fox hunters. Owners Jerri and Bill Jackson watched and took note as the community and its needs grew. Several years ago they opened a beautifully-appointed 12,000 square feet retail space that carries a vast array of clothing and accoutrement for equestrians and non-equestrians alike. One can spend hours on a visit to Tri-County Feeds, Fashions, Finds. On-line shopping will never compete with this fun shopping experience. Worth a look-see on the way to Tri-County is Number 18 School, the last one-room school in Fauquier County. It was a blacks-only school house until closing in the 1960s following desegregation. Community activists and garden clubs have taken Number 18 School under their wings and have lovingly restored the building and grounds. Marshall’s popularity is evident in the always-booked and aptly-named Rooms Up There. Located at 8393 West Main Street, the rooms are above the design studio of Daniel J. Moore and his shop, Domestic Aspirations. The beautifully appointed rooms use furniture and decor from the shop, which carries a carefully edited collection of American and European antiques as well as fine reproductions, contemporary accents, designer lighting, found objects, and fine art. About the author: Meg Mullery is a licensed real estate agent and consultant with the Washington Fine Properties offices in Middleburg and Marshall. Before embracing a more rural lifestyle, a decision she has never regretted, she lived for many years in Adams Morgan in Washington, D.C. and then the Del Ray section of Alexandria. She can be reached at meg.mullery@wfp.com or 540-878-3307.